Having moved through two models of poetic careers — the compaction of Whitman and the expansion of Goethe — I thought I had found a third model in the case of William Wordsworth. Using the same measures as before, I found that it was Wordsworth’s middle period that registered as the most “innovative” or experimental. We can imagine how in this sense a poet grows into greater degrees of diverse writing styles — a sense of “maturity” — which gradually then compress as the poet ages. There is a strong biological model of rise and fall at work behind this theory. For the purposes of this project I am understanding innovation primarily as a sense of linguistic diversity — the more a poet experiments with different vocabularies the more a particular period in his or her life can be thought of as a period of experimentation or innovation. That’s clearly just one way of thinking about periods and innovation of course, and I’m open to many more suggestions of how to think about this. But what interested me about Wordsworth was the way the middle period appears at first glance to fit this model and then doesn’t. 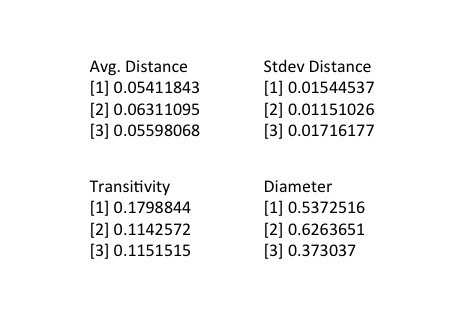 Here are the same measures used for each of the three periods. (Period 1 = 1787-1815; Period 2 = 1816-1832; Period 3 = 1833-1851). As you can see, the average lexical distance between works increases in the middle period, as does the overall diameter of the network, just as the transitivity (the number of closed loops) decreases. There’s obviously lots to quibble with in terms of how to mark out the periods of Wordsworth’s writing, but I’ll leave that aside for now (suggestions welcome). But for Wordsworth scholars to say that the years 1816-1832 were a period marked by a great deal of innovation will seem deeply counter-intuitive. This is after all the era in his writing most defined by the ecclesiastical sonnets. Surely a turn to religion, and its formulaic writing, can’t be seen as innovative (I’m parodying here). If we plot those distances, however, we begin to see a different story. 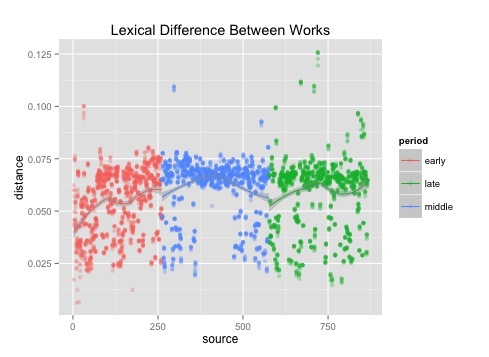 What you can see happening in the middle period is the way the average lexical distance between works increases, but the variance shrinks (the standard deviation score that we saw above decreases in the middle period). That big clump in the middle where the curve rises are the ecclesiastical sonnets. So there is in fact a great deal of formal consolidation at work, but one that looks on average to be greater than the rest of the corpus. It’s not that we should ignore the fact of an overall lexical heterogeneity, but that we need to see it in a particular light. There is a greater average difference between poems but also a greater degree of homogeneity to that difference. I’m not sure if innovative or experimental would be useful terms anymore here, but it does tell us something about the poet’s career and the different shape periods can take. In my next post I’ll try a different method using community detection to model this idea of linguistic coherence as a marker of poetic period.